Ellis Island. Image via Save Ellis Island. From its start, New York City has been mired in territorial disputes. 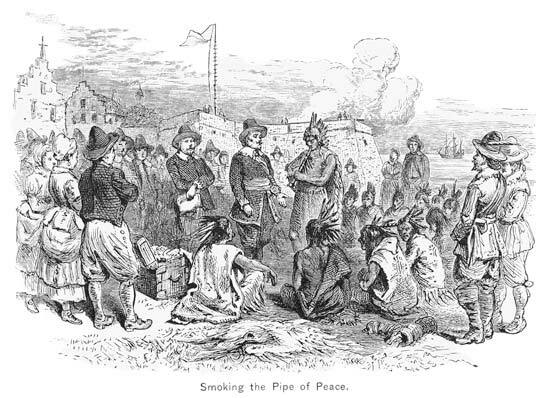 The Native Americans, the Dutch, the British, New Jerseyans, and even New Yorkers have all fought against one another, and themselves, for control of the land that comprises New York City. In some ways, border disputes are still on-going today, with less bloodshed, over the naming and boundaries of neighborhoods. Going back in time, here are eight territorial disputes that have affected New York City, waged between countries, states, cities, boroughs, and more. Between 1641 and 1664, the Dutch and Native Americans fought a series of wars for control of the nascent Dutch Colony, New Amsterdam. Kieft’s War, the Peach War, the First Esopus War, and the Second Esopus War are largely forgotten today but had an indelible impact on the history of New York. For example, Kieft’s War, also known as the Wappinger War, was started at the behest of Governor Willem Kieft who sought to avenge the theft of pigs from the Staten Island Farm of David de Vries. Ultimately, it was determined that other Dutch settlers had stolen the pigs and Kieft used the incident as a pretext for taxing the tribes or to take over some of their land. Kieft’s War ended tragically with the destruction of many of the colony’s settlements and the deaths of many on both sides of the dispute, including Puritan settler Anne Hutchinson and six of her children. Kieft was recalled back to Amsterdam and was replaced by Peter Stuyvesant, beginning a new chapter in the city’s history.